The official world women’s rankings have been updated for the first time in 2019 as Reanne Evans claimed her third title of the season at the Belgian Women’s Open last weekend. The WWS world rankings operate on a rolling two-year basis, with points earned during 2016/17 to be removed during the course of this season. At this revision, points earned at the 2017 Connie Gough Trophy were removed from the ranking list and replaced by those earned at this year’s event held at The Trickshot in Bruges. Hong Kong’s Ng On Yee has completed 12 months at the head of the world women’s ranking list following her run to the final last weekend in Bruges. In fact, despite losing out to closest rival Reanne Evans in the title match, On Yee has actually extended her lead because she was defending no points at this cut-off, while Evans had 3,200 coming off having reached the semi-finals of the Connie Gough Trophy in 2017. It is not all bad news for 11-time world champion Evans however as her defeat of the top seed has strengthened her position in top spot on this season’s one-year ranking list with 6,000 more points to her name than On Yee. With On Yee set to lose 20,000 from her total over the next six months following her flawless end to the 2016/17 season, there is a very real prospect that top spot will change hands before the end of the season with Evans due to defend only the 6,400 points earned by her semi-final run at the 2017 World Championship. Despite the removal of points earned two years ago in Dunstable and the addition of those earned in Belgium, there are no changes of position inside the top 10 this week. There is in fact a close battle for fourth place with just 2,525 separating Catalano, Katrina Wan and Laura Evans, with all three players defending a similar amount of points between now and the end of the season. Further back, Suzie Opacic is under increasing pressure from Thailand’s Nutcharut Wongharuthai, who having reached the semi-finals or better for the fourth time in five events so far this season, looks destined to continue her surge up the ranking list over the coming months. Among the biggest movers further down the rankings is Belgium’s Wendy Jans as the 12-time EBSA champion rises nine places to 23rd position following her second semi-final run of the season. A stronger player than her ranking would suggest, she will only continue to climb the ranking list with further tour appearances over the coming months. Also on the rise is Jackie Ellis who climbs two places to a new career-high of 21st position, as well as Dorothee Rapp and Connie Stephens who are up to career-best positions of 31st and 32nd respectively. Germany’s Tanja Ender also rises one position to 40th despite not competing in Bruges. There are six new names on the ranking list this week including Jane O’Neill, who made her first appearance on the circuit since 2003, reaching the last 16. Both Vicky Shirley and Danielle Findlay fall off the list having not competed in over two years now. There is a change at the top of the Under-21 ranking list as with Shannon Metcalf absent from the tournament, a semi-final run from Emma Parker was enough to see the Hornchurch youngster reclaim the number one junior ranking for the second time this season. Steph Daughtery, who captured the title in Bruges with a brilliant win against Nutcharut Wongharuthai consolidates third position, with her Thai opponent rising into the top four for the first time ahead of Aimee Benn. Zoe Killington moves up to eighth position after winning her first match at under-21 level against newcomer Anne Kuijpers. 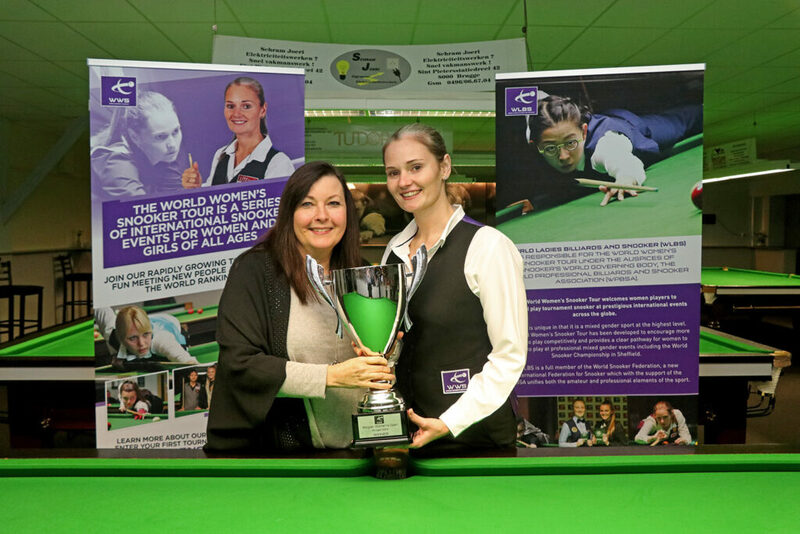 The World Women’s Snooker Tour will return with the Festival of Women’s Snooker from 12-15 April 2019. Having completed both the Level 1 and 1st4Sport WPBSA Level 2 courses during the past couple of years, Rebecca is now a full-time snooker coach when she is not competing herself as a player and will be lead coach at the Cue Zone during this year's Women's Snooker Day 2019 activities on 1 May 2019. © 2018 (WWS) World Women's Snooker all rights reserved. This information is based on copyright laws in the U.K as provided on www.copyright.gov. It is provided as general information and is not a substitute for professional legal advice.